I wasn't sure if I would get to share the nursery before she arrived or afterwards, but as it turns out...I'm almost 39 weeks and still going strong. It's the biggest relief that I have now made it to term and don't have to be scared all the time! I mean, now there are new fears (like LABOR), but it's still a really nice feeling to be happy and excited for a change. Anyway, thank you guys so much for being so patient and understanding during all of this. And of course, for all of your encouraging words along the way. It's truly meant so much. 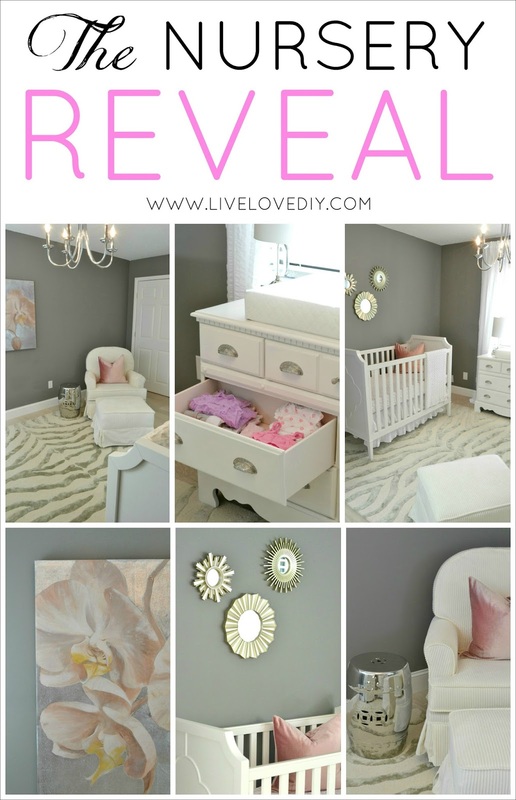 So, let's get started with the nursery tour! I decided to use the guest bedroom down the hallway, right off of the kitchen as the nursery. The room was already painted Benjamin Moore Chelsea Gray, and although at first I thought about repainting it something different, once I started playing around with the room, I realized just how much I loved the dark gray for the nursery. It's really calming and makes the room so cozy. 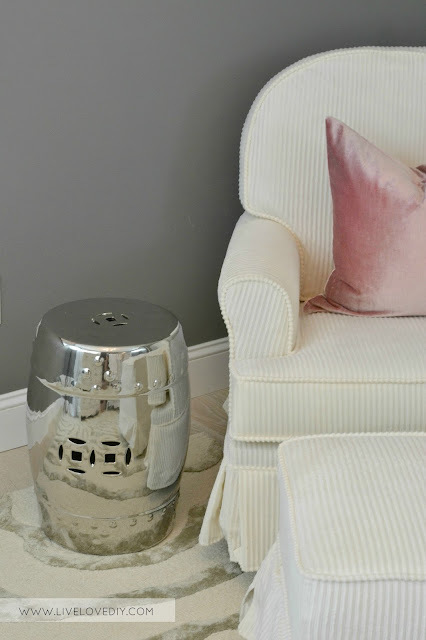 As my accent colors, I kept it simple with just a few little pops of pink and some metallic silver. The room came together slowly over the course of a few months, using a lot of items we already owned, combined with a few new items. My grandparents generously gifted us a crib, and that allowed me to save quite a bit of money and spend it on other items we needed. I kept the bedding simple with this ruffled bed skirt and this pink fitted sheet. The velvet pillow is from our basement and is just in the crib to make the photos prettier. My mother in law knitted the most precious baby quilt, with little pink bows at each corner. She had no idea what the nursery looked like, so I find this to be the sweetest of coincidences. 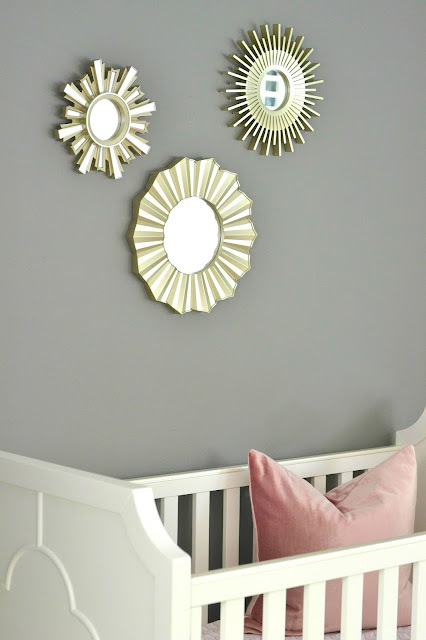 I added a few little metallic sunburst mirrors above the crib. Again, probably something that will get moved once she gets old enough to be all grabby. I think I'm probably not supposed to tell you when something is done just for show, but whatever...'tis the truth. One of my favorite parts of the room is the rocking chair. I spent months looking for an affordable white rocking chair for the nursery, and everything I found was SO expensive and totally out of my price range. There are apparently droves of women paying $1500 for a baby glider, but well, not in this lifetime, sister. So, determined to find something that looked comparable to the high end rockers, but cost a fraction of the price, I finally found this nursery glider from Walmart. I was nervous it would be big and bulky and ugly in person, but when it finally arrived, it was perfect. To give you an idea of where the nursery is, you can see the dining room through the doorway in the above pic. The pink rug is still going strong in there. THANK YOU GUYS SO MUCH for your response to that last post about our new floors...such a relief to have them done and done right. Anyway, the glider is the perfect size and it just so happens to be the most comfortable chair I've ever sat in. I've caught Jesse sitting in here multiple times, just twirling himself around in the chair. He's suggested that every chair we ever purchase from now on should swivel and rock. I also added a little silver garden stool...a place where I can set drinks or books or pizza. I've had a lot of people ask me how I keep white stuff so white...like rugs and furniture, and obviously, this glider. And the answer is that I use something called Vectra (affiliate link) on everything the minute it comes into our house. It's a little pricer than something like Scotchguard, but it protects your upholstery from almost any stain and it doesn't make your fabric feel all hard and waterproof like Scotchguard does. Basically, it works and I like it. Speaking of rugs, I decided to use the zebra rug from the guest bedroom in here. It just fit perfectly and gave the room a little extra oomph. 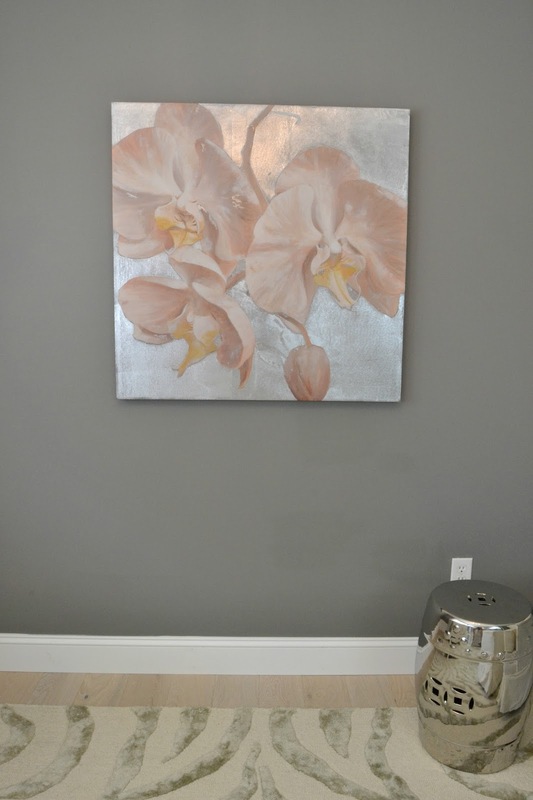 For wall art, I kept it simple with this painting I found locally. It was actually the first thing I bought for the nursery, months ago, and it kinda set the tone for the entire room. I knew the minute I saw it that I was going to do a silver and pink nursery. 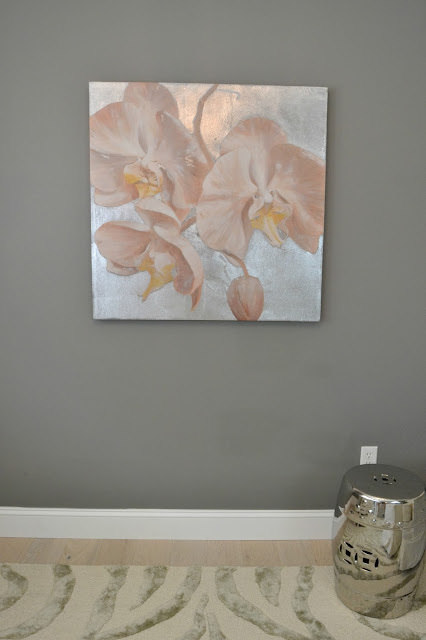 I had pinned about a million nursery decor ideas and had a bunch of different color schemes running through my head, but once I found this painting, everything kinda came together. For the changing table, I decided to repurpose this old dresser that I had already painted awhile back. I had previously painted it a light blue (you can see the original makeover here), so I decided to just paint it white and update the hardware. Easy fix. It took me forever, but I also painted the insides of all the drawers a light pink color. Now they are nice and clean and perfect for storing all of her little clothes. It's hard to tell in these photos, but I swear the drawers are pink. Professional photog, at your service. I also updated the hardware with these really pretty cup pulls, which totally make the dresser. On top of the dresser, I added a cute little lamp, a changing pad, and a little pink basket for holding diapers and such. And that's pretty much it...our little nursery is all ready! Thank you guys so much for being here and for being so encouraging and supportive throughout this entire journey. Our little lady is due at the end of June, and although I plan to take a little time off so that we can enjoy our time together and figure out our new routine, I will make sure to give you guys a quick update either here on the blog or on Instagram (depending on how exhausted I am) after she arrives. Love, love, love! Very sweet. Totally you. Thank you so much, Jaclyn! Virginia, I love when you have a new post and I especially love this one. It reminds me of all the excitement I had when my daughter was born. (She's 15 now.) 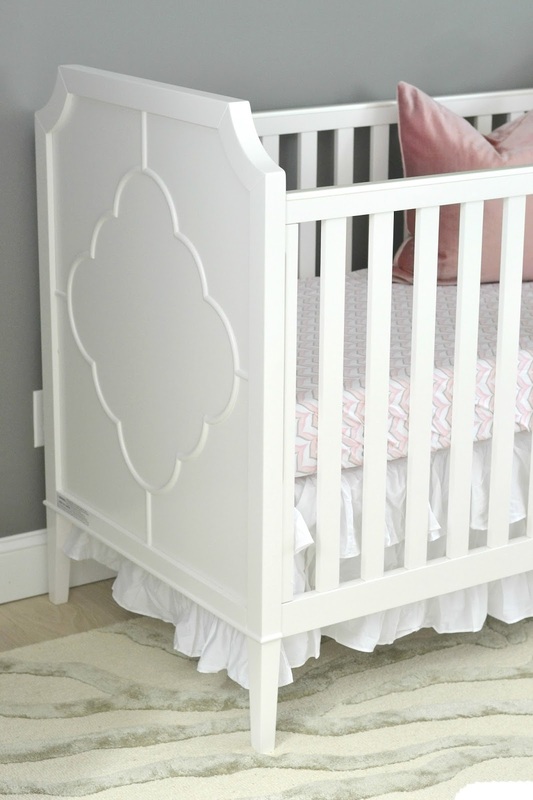 The room is so dainty and beautiful--just like your sweet little one is going to be. :) I especially like your inspiration print. You were right, they are the perfect colors. Perfect! So glad you've made it to term...can't wait to hear when the little princess arrives! Wow from the New Forest, UK! Your baby girls room looks so pretty, just gorgeous. Don't worry yourself about the labour - do whatever your body tells you to do. It's the most amazing experience and you get a baby at the end of it! Your house is a beautiful nest just waiting for your baby to arrive. Virginia, your daughter's room is so calm and lovely. Congratulations! Now rest as much as you can and get ready for that little babe. Love to you all. So beautiful! Both the nursery, and the mama! I'm happy to know you are progressing well! 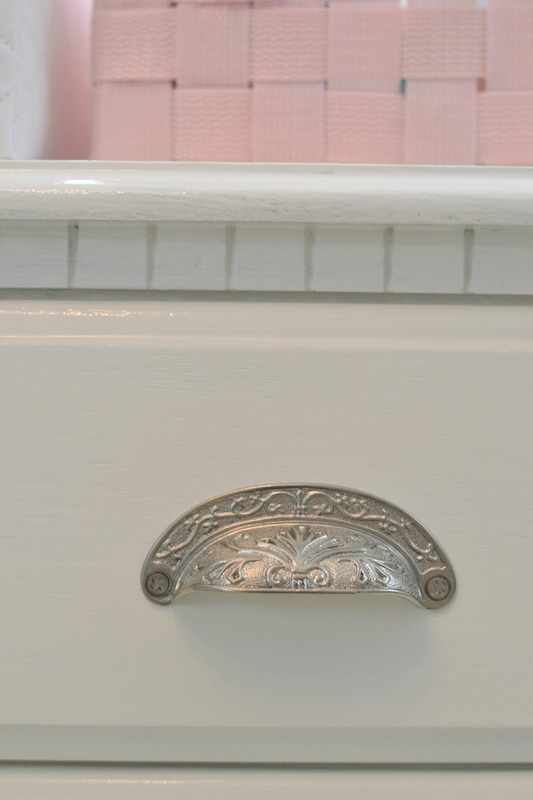 I can see the pink in the dresser, and the pulls are gorgeous! his or her work? It makes the room and will last thru adulthood. Congratulations. I'm not sure...I wish I knew though!! Gorgeous!! I love, love, love the dark gray nursery. It's stunning!! I love the sunburst art, too... even if it's just for show right now. 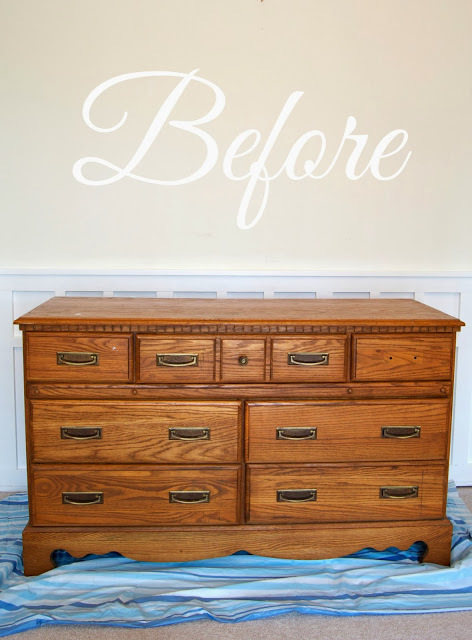 ;) And.... you did an AWESOME job redoing that dresser. I'm so amazed at how great it looks - I wish I had that kind of vision!! Congratulations! The nursery is so pretty and you look radiant! My little girl is 15 now too and yet I can still remember how I felt the moment I saw her sweet little face for the first time. It was like meeting someone I already knew. I agree with Jeanne. Get as much rest as you can - anything "not done" can wait - and focus on getting ready for the little bundle of joy to come. All the best! Absolutely lovely. I have a 6 week old little girl, and we finished her nursery about 4 days before she came! A word of advice regarding the rocker: you will probably want a stash of burp cloths nearby for the inevitable; I didn't think to have more than one in arms reach until after a big spit up :) Congratulations, and I hope you are able to relax and enjoy the time til your little comes...it's a heck of a ride! Thank you Kim! I'll definitely have a bunch stashed nearby! Beautiful nursery! Also, love the paneled doors- are those new? It's lovely! Sweet girl is going to have a beautiful home to grow up in! Thanks for sharing, can't wait to "meet" her! Beautiful!! Every detail is perfect!! God bless you and your new baby!! I've been so excited to see your nursery!! Love the color scheme and that artwork is to die for! PERFECT! Love every single detail!!! This looks beautiful! I love that shade of gray mixed with all the feminine pink and white. I'll be thinking of you as you get closer and closer to meeting your little one! I love it. So clean and uncluttered. Beautiful job. Such beautiful nursery! Very calm and fresh. You did great and your new little one will be so happy there! Congrats! Looks great. My 3rd baby girl is on the way and I've been trying to decide whether to move my 2 older ones downstairs to our current guest room or just leave them be and have baby room with me like the other 2 did. 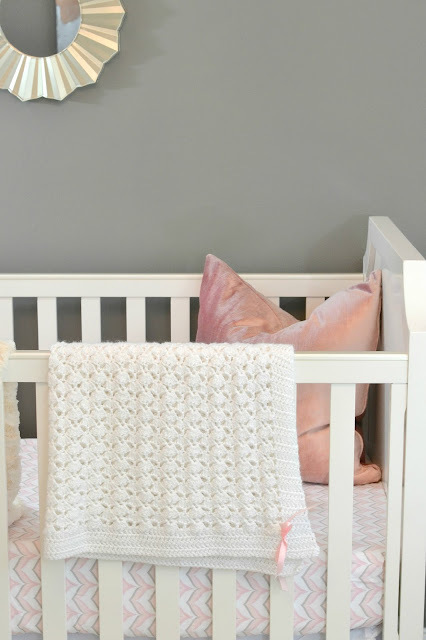 Seeing your nursery makes me want to create something special, but I have a feeling my husband would prefer to leave the older 2 alone for at least another year. Love everything you did. The wall color really does tie everything together. BTW, labor really isn't that bad. And don't feel like you can't get an epidural. One word for this post: LOVE. I wish I had the guts to do a white nursery but with a dog, 4 year old (and husband for that matter, lol), I don't think I could keep it as beautiful. 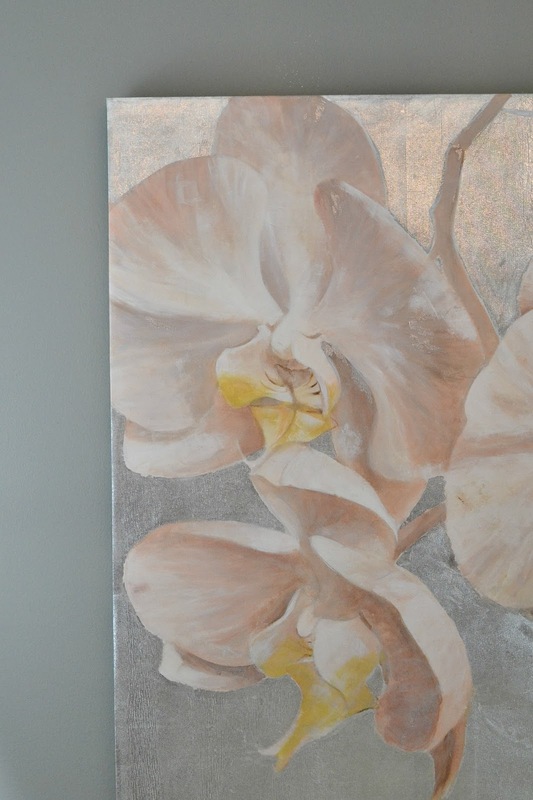 I'm especially in love with the wall art--how simple but so gorgeous. Congrats on you coming bundle of joy--she will love her new digs!! The nursery is just beautiful Virginia. You both are going to be amazing parents. Blessings to your family. so beautiful! love all the simple but pretty details! Congratulations on making it to term, and I am glad you get to enjoy happy moments and the good kind of anticipation! 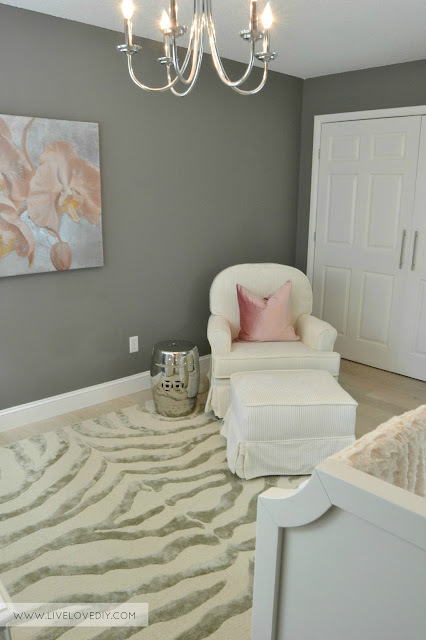 The nursery is so pretty and soothing - I LOVE LOVE LOVE that painting!!! What a fantastic find! Beautiful and classic--she can grow with it! Fantastic job and congratulations on your new little sweetheart! I love this nursery! Quick question about the dresser: did you use your trusty Sherwin-Williams ProClassic paint again, or did you go for a different type? I'm in the process of doing my changing table right now (I literally just finished priming it), and I still need to get paint for it. Before I head down to my local SW store, I wanted to check that your process was still the same with this since it's in baby girl's room. Thanks in advance! Your nursery is absolutely beautiful. I have a quick question, if you don't mind answering. 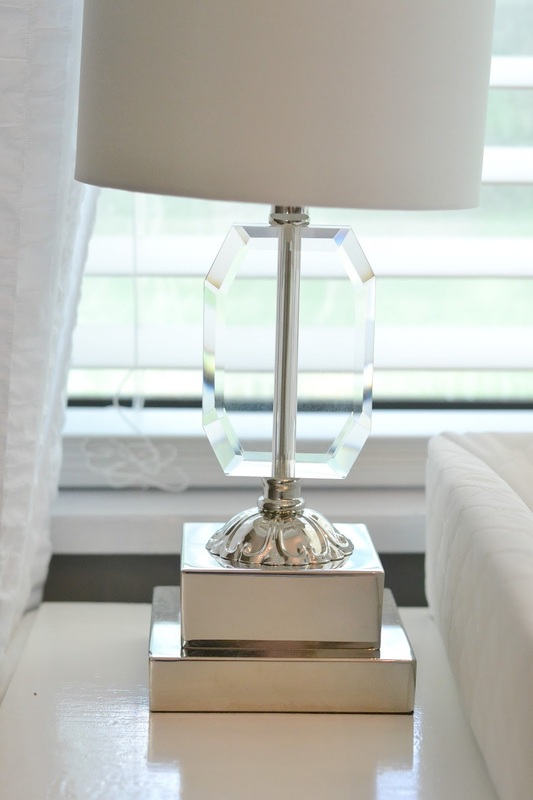 What do you use to seal your white furniture? A lot of what has been recommended to me has a warning (or has reviews) stating that it may/has turned white paint yellow.